You may not remember me. I'm a good friend of Richard's. I met you eons ago when you visited Maui and we enjoyed a great Thai dinner together before your speaking engagement. Man, have events evolved since then. Richard occasionally forwards your comments to me, which are always concise and accurate. I hope I'm not taking your valuable time unnecessarily with this, but I found it of interest. I have marveled at the piloting skill allegedly displayed by the 9/11 hijackers who, with no real experience in flying aircraft that weigh 272,000 pounds (757) and over 400,000 (767). With no experience, these guys supposedly threaded a needle at hundreds of miles an hour and hit towers barely wider than the aircraft, and hit the pentagon exactly at ground level. Richard an I are both pilots and understand the challenge for even and experienced pilot. 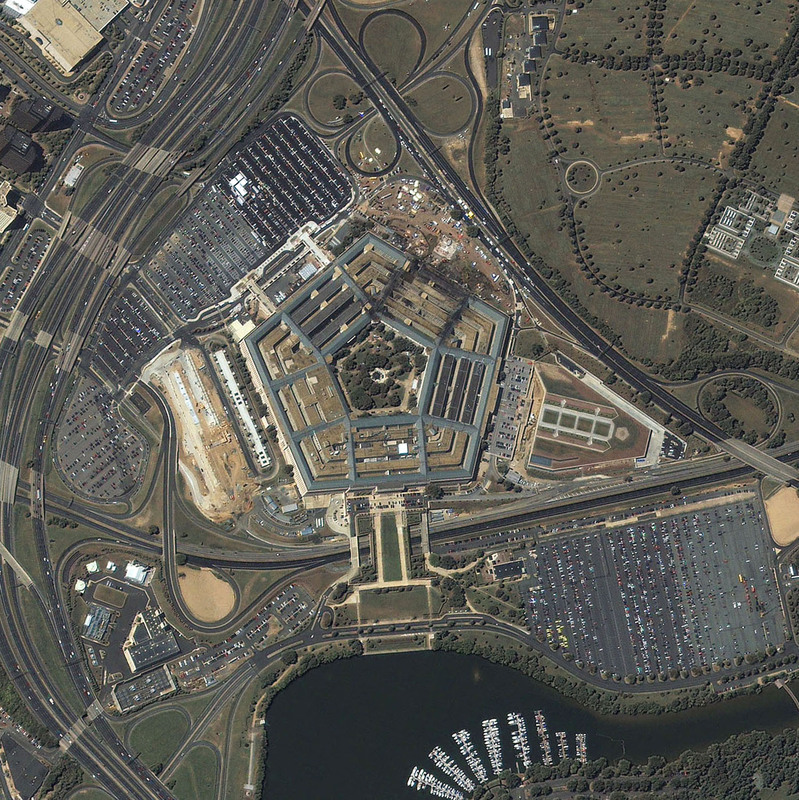 Anyway, I am attaching two satellite photos of the Pentagon. One before, one after. On the one before, I draw your attention to a line across the grass just left of the Heliport in the photo. I'm not familiar with the building (as I know you are), so I don't know what compass direction that is. The line is almost exactly aligned with the path the aircraft that hit the building. You can see that by putting the photos side by side. Maybe it is from a landing system for the Heliport. Maybe it is evidence of a buried ILS or other guidance system put in place just for the big event. Maybe a path worn by generals pacing back and forth in a straight line. I have not been able to find out anything about possible navigation aids in place for the Heliport - probably available info for military pilots only. 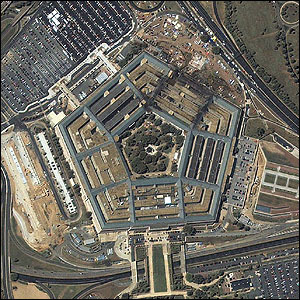 The Pentagon - September 7, 2001 This one-meter resolution satellite image of the Pentagon was collected on Sept. 7, 2001 by Space Imaging's IKONOS satellite, only four days before the terrorist attack. 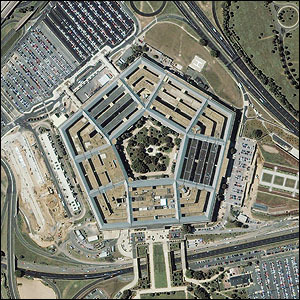 Clearly visible are the cars in the parking lot, the Pentagon's renowned five-sided shape, the building's inners rings and its five-acre courtyard. 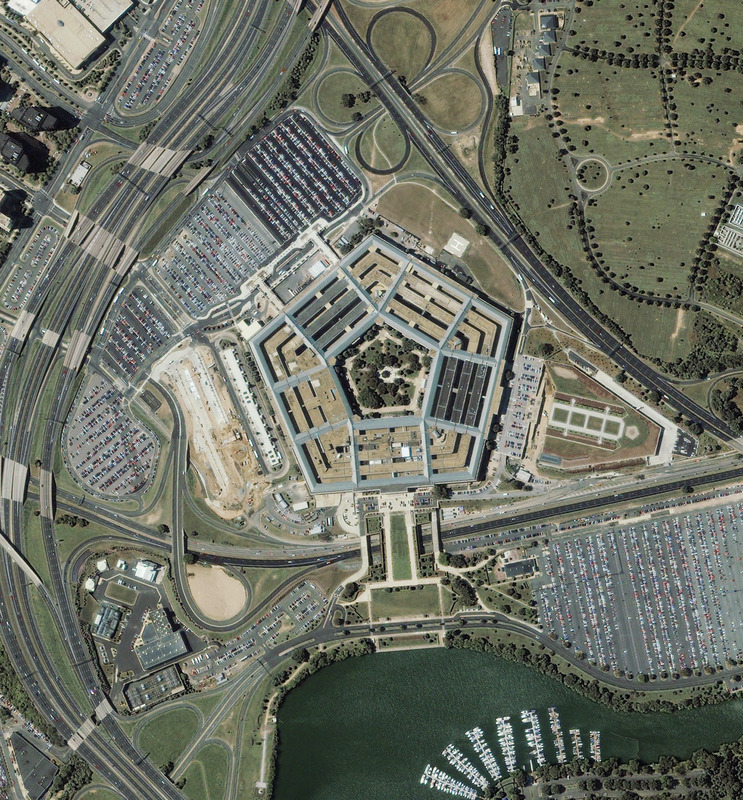 The Pentagon - September 12, 2001 This one-meter resolution satellite image of the Pentagon was collected at 11:46 a.m. EDT on Sept. 12, 2001 by Space Imaging's IKONOS satellite. The image shows extensive damage to the western side and interior rings of the multi-ringed building. Also visible are the emergency and rescue vehicles parked around the helipad. Since all airplanes were grounded over the U.S. after the attack, IKONOS was the only commercial high-resolution camera that could take an overhead image at the time. I hope its of interest. That's all. Food for thought that's been bugging me ever since I found the photos. I do recall our dinner in Maui warmly. Is Richard back on the island? I have been out of touch with him but not wanting to be. Do you have a number for him? Many of us asked exactly your question about the "pilots" on 9/11. The Washington Post quoted experienced pilots saying that it would have taken a military or commercial pilot with a great deal of experience to do those manouvers at the Pentagon, a 270 degree descending spiral and then flying 450 knots plus knocking off lampposts. These are huge aircraft. When they are flown in a dogfighting manner like that it stresses them structurally as well as being very hard to remain stable flying so low and so fast. I was told that large commercial planes have over-rides built in to prevent pilots from flying outside set limits that affect overall safety and performance. If so, someone had to know how to disengage them. Most of the alleged pilots were minimally trained on small planes and simulators. One instructor said if they had tried to do it on a simulator, the simulator would have shut down. My first question was, if you are above cloud cover over Ohio and Pennsylvania and you shut off the transponder and communication with a flight tower, how to you aim the plane at another city much less at those towers? How to you hit them at that speed?, exactly as you noted. And then I asked why go all the way around the Pentagon to hit the empty side? Why not just plow straight in? The timing of the flights, which all took off later than announced, minimized the number of deaths in NYC as well, since most people were not yet at work when the first plane hit. An hour later it would have been tens of thousands dead. Flight 77 never hit the Pentagon, a cruise missle did. This is total bunk but it has advocates around the internet. If you lived in DC you would know that the plane hit the building. Loads of direct witnesses. No other explanation for the wreckage and bodies. And I have more proof than I want to go into now. So dump this one. Someone else flew the planes. There is evidence that the alleged hijackers on the "suicide mission" were using false identities and at least five of them came forward in Saudi Arabia to say they were alive and their pictures and names had been displayed as suspects. An inside source told me that American Airline pilots say that the actual pilots flew the planes until the very last minute. No way to verify this yet. Cannot imagine, short of MKULTRA, how they would get one of them to do it. Only one of the alleged pilots, Atta, had enough training, including some at US military bases, to come close, and his was the most straightline flight of the three. Another inside source told me that an attendant on Flight 77 called her mother by cell phone and asked her to report that "we are being hijacked and there are six of them". The official story only has five terrorists aboard. Was there an extra person? I do not believe that there has ever been a mass suicide in human history and I have studied all the claimed ones. Individual, and kamikaze, yes, but not group and not planned for months. One at the very most per plane may have been suicidal, or programmed somehow, but not 19. Global Hawk or other technology overrode the pilots and flew the planes automatically or by some predetermined course. This might fit into your anomaly in the photo, though I do think it takes more than a beacon to guide a plane in towards a target. My problem with this theory is trying to imagine how you would do the loops and fly so low without being at the controls, and without crashing. One CIA source known to a friend claims it can be done by inserting the flight path on a programmed disk and locking it in so the pilot cannot override. Still, I find the last minute banking on tower two to clip the corner and the Pentagon pattern unlikely if you could either pre-program or control flight in real time. Straight lines are much easier. This one seems remotely possible but unlikely to me. As a pilot, do you have any other possible explanations besides a very experienced flight jockey familiar with these aircraft? The photos are interesting, can you give me the precise timing on each one? Thanks for sending this along, I will add you to the 9/11 email list. See our website at www.911citizenswatch.org and follow the links to the excellent and detailed timeline at www.cooperativeresearch.org and the articles there. Great to hear from you. I saw a clip of you on a panel of researchers discussing 9/11 in New York. Cynthia McKinney, Mike Ruppert, and others were there. I hope things are well with you. I'm building a house in Fiji and will be moving there next year. I'll spend part of the year there, the rest in other countries. No plan to return to the US any time soon. When people ask, doesn't it bother you that Fiji had a coup in 2000? My answer is, wake up, the US had a coup in 2000 as well. The difference is that George Speight was sent to prison for treason. George Bush was sent to the White House. As for your 9/11flight questions. . . . The only times given on the satellite photos are Sept. 7th for the before photo, and Sept. 12th for the after. I can't find earlier shots which would tell when that line first appeared. In my view, this was an attack that was allowed to happen and actively participated in by parts of the government. It was not a terrorist attack. A terror attack on the American people would have targeted places like Disney World. This was an attack on global business -- the WTC, and corporate empire's legionnaire headquarters, the Pentagon. I also believe the plan was to also hit the Capitol so that Bush would have been in total control. Ironically I have actually crashed a simulator plane into the WTC several times in the 1990s. I was not trying to do so! I was trying to do a stunt by flying between them. It was difficult to do even with a small plane, let alone a "heavy aircraft". Anyone can give it a try with Microsoft Flight Simulator software on a PC and get an appreciation of what is involved in maneuvering. To deliberately hit the WTC, one would most likely program the latitude and longitude into the auto pilot and let the GPS system take you to within a couple miles where you would acquire visual contact, disengage the auto pilot and make last minute corrections by hand. Remember that at 500 mph, a mile goes by in 7.2 seconds! A standard rate turn will take 1 second for every 1 degree of change in heading. Thus the relatively steep bank of the aircraft making the first strike as the pilot tries to correct his heading. Ideally one would line up several miles away and hold a steady course (as you point out). An airplane that size just does not respond quickly. It is like steering an oil tanker down a narrow channel. As for the Pentagon hit, did they recover bodies? I never heard that. I don't know the radius of the turns made, so I can't comment on how difficult they were. All instrument rated pilots know the angle for their aircraft that will turn an airplane around 180 degrees in three minutes without any strain. Its a fairly shallow angle -- maybe 18 degrees -- so as not to cause stress on pilot or plane and is easy to control. A bank of 60 degrees will give you a very rapid rate of turn, and cause the passengers to feel 2 g's -- not comfortable (as they will feel that they weigh 2 times as much as they do), but well below the 3 g's or so that the aircraft can handle and 1/4 of what an average person can take without blacking out. I doubt a novice pilot would be able to handle steep turns without losing control of the aircraft though. I can do it easily in a Cessna, but I would most certainly crash a 757 if I attempted it without a lot of training. Lining up on a specific path and "glide slope" -- ie the direction horizontally and the angle vertically -- is where I find the Pentagon hit rather amazing. A 757 weighs something over 270,000 pounds, so it isn't exactly agile, yet it hit right at ground level on the outer wall. The GPS system in the airplane tied to the autopilot and augmented by a repeater station on the ground can make for a highly accurate flight path. An ILS (instrument landing system) which requires a ground based radio antenna array can also be fairly accurate. My guess is that these aircraft were flown by their airline pilots under duress until close to their targets. Or, as some have suggested, they were controlled by experienced pilots on the ground, such as the guys that fly the Global Hawk drones as you state as one theory. That works for me except for the convoluted flight path over DC. That suggests a human in the cockpit looking for their target visually. The most obvious reasons to fly around to the other side of the Pentagon are 1) You didn't see it in time to hit the closer side or more probably 2) Rumsfeld was in his office, and the other side of the building is undergoing renovation and is lightly occupied. Just as with the WTC -- they minimized fatalities. Perhaps my ramblings add nothing. But it is clear that airline pilots did not crash into buildings at the point of a knife or gun -- they would deliberately crash in an open field or river rather that do that. And to get 19 people to commit suicide on this kind of mission is a far reach as you point out and to me, there is no evidence they had anywhere near the amount of training to even attempt such a thing. That leaves remote pilots, in my mind. The last minute jockeying at WTC and flying about in circles in DC indicates some person was controlling the aircraft, not just an autopilot. And it was someone with skill. As for the line on the ground in the photo, all I can say is, I don't know, but it seems a very odd coincidence worth looking in to.